Whether you are on a KETO diet or not…bacon is a fan favorite of many. Granted I personally have been trying to push meats away for the most part lately (call me an on-again off-again vegan)…but bacon is one that keeps calling me back. One of our household favorites is bacon wrapped jalapenos stuffed with cream cheese – but this one I feel may be an equal if not immediate second. 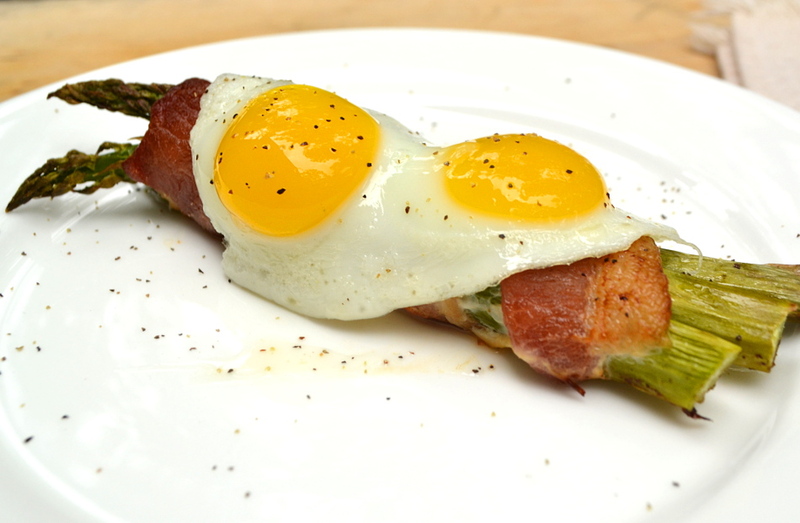 Wrap one bacon slice around each bundle of three asparagus spears. Place each bundle on a parchment lined baking sheet. Sprinkle the garlic, onion power, 1/4 teaspoon of salt, and a pinch of pepper over the bundles. Place the tray in the preheated oven. Bake for 12 minute, or until the bacon crisps. In a large skillet over medium-high heat, melt the butter. Crack the eggs into pair into the skillet. Try to keep the yolks intact. Cook the eggs to your desired doneness. Season with the remaining salt and pepper. Remove the asparagus from the oven. Remove the eggs from the skillet, placing two eggs atop two bundles of asparagus per serving.